HARRISBURG – In a reversal from a vote the previous evening, a $2.3 billion transportation funding package cleared a major hurdle in the state House on Tuesday night. The Senate is expected to take up the bill today. 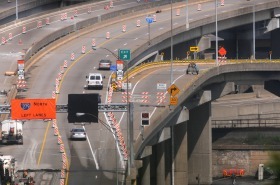 The amendment the House approved Tuesday would provide up to $2.3 billion in annual transportation funding for roads, bridges and mass transit by the fifth year of its implementation. It was approved in a 104-95 vote, a reversal from a 98-103 vote late Monday, when the measure failed. "I think a lot of people needed more detail, more explanation of things," said Rep. Stan Saylor, R-York, one of the six representatives who flipped their vote Tuesday. House leaders denied that any pressure had been applied, though getting the measure through was a major legislative priority of Gov. Tom Corbett. "I didn't do anything," said House Speaker Sam Smith, R-Punxsutawney, after the vote. "People just decided to vote 'yes.' "
Secretary of Transportation Barry Schoch said Tuesday that the previous evening had been a sobering one for him and for the House. "I think both caucuses left [Monday] night somewhat surprised and disappointed that they didn't get this done," he said. "And today they had very serious discussions in their caucus about how they can get some of these votes of people that, frankly, I think went into it thinking they didn't have to vote for it, that others would. And some of them had to realize they were the others." The Senate could act on the measure as soon as today. "We will caucus on what was approved by the House tonight and proceed from there," said Erik Arneson, a spokesman for Senate Majority Leader Dominic Pileggi, R-Delaware. "That said, what the House approved appears to be fairly close to what a strong bipartisan majority of the Senate approved in Senate Bill 1," a similar measure approved by the Senate in June. Mr. Schoch said the Senate is expected to now pass the proposal before it is returned to the House for final approval. Ideally, he said, Mr. Corbett would sign it into law Thursday. The amendment raises $2.3 billion to $2.4 billion by the fifth year, with $1.3 billion devoted to state roads and bridges and about $480 million to $495 million for public transit. The remainder of the money is earmarked to local governments for road maintenance ($237 million), Pennsylvania Turnpike projects ($86 million), a multimodal fund ($144 million) and repair of dirt and gravel roads ($30 million). Like the Senate version of the plan, the House amendment raises revenue mainly by removing a cap on the oil company franchise tax paid by fuel distributors, a move expected to be passed along to consumers -- and the source of many objections about the bill. The oil franchise tax, which now is assessed on just part of the wholesale price of gasoline, would be extended to the full wholesale price. A Pittsburgh Post-Gazette calculation estimated the cost to the average driver would be about $3 per week, depending on gasoline prices and how much of wholesalers' added expenses are passed on to consumers. The proposal also generates revenue through small increases to the fees for registering vehicles and obtaining drivers licenses. Rep. Daryl Metcalfe, R-Cranberry, long an opponent of the measure, charged it would "take the taxpayer to the cleaners." Other opposition came from Democrats who did not like the inclusion of language that would change prevailing wage laws that require union-scale wages on public construction projects. The amendment the House approved changed the current threshold of $25,000 in work triggering a prevailing wage requirement to $100,000 starting in 2014. "That was my issue with this bill," said House Democratic Leader Frank Dermody of Oakmont, who voted against the measureMonday and Tuesday. He said he was supportive of the transportation measures but the issue should not have been tied to prevailing wage. "We felt this [transportation] should have been done on its own," said Rick Bloomingdale, president of the Pennsylvania AFL-CIO. Allegheny County Executive Rich Fitzgerald, who had spent Monday and Tuesday in Harrisburg lobbying hard for the measure, said the mass transit funding is especially critical to keeping the Pittsburgh region economically competitive. "We are going to have the buses running and the transit system running, and we are going to continue to invest and grow our economy," he said Tuesday after the vote. Dennis Yablonsky, chief executive officer of the Allegheny Conference on Community Development, which had also lobbied for the issue, said it is particularly important to the Pittsburgh region: "We're the city of bridges," he said. Two Eastern Pennsylvania Democrats, Reps. Scott Petri and Will Tallman, did not vote Tuesday.